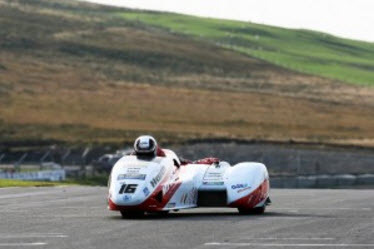 Riding the new 600cc Honda housed in an LCR Monocoque chassis, Mansfield sidecar racers Ben and Tom Birchall registered a fine second place in the Jock Taylor Memorial race at Knockhill on Sunday. 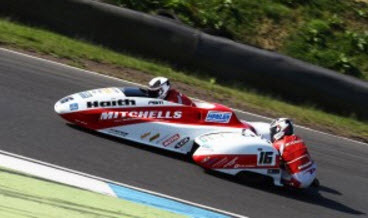 The Mitchells of Mansfield supported pair also took part in Saturday’s Sidecar race where they finished in third place. He said: “The bike is fantastic to ride and considering it was only the second time it has raced I am pleased with the pace and feel there is much more to come as the development continues. 2016 is to be a transitional year for the world championship with both 1000 and 600 engines being used and in 2017 the championship will switch completely to the 600 engine. “We enjoyed entertaining our guests from the Hayley group, I am sure they enjoyed their day with us especially as the weather was so nice. It was great to be invited to Knockhill to race in the Jock Taylor Memorial event. Ben and Tom will be back in action at the weekend when they contest the penultimate round of the British championship at Silverstone. This will be followed by Stars at Darley at Darley Moor on October 11 after which they will be at Brands Hatch for the final round of the British championship on October 18. Podium Shot: Ben and Tom Birchall, Sean Hegarty and James Neave, Phil Bell and Ross Jackman.